He’s my oldest friend in the world and I love him like my own brother. But I don’t think I’ll be talking to him for awhile. Because to him, Eric Garner, a black man who died on the sidewalk in police custody, having protested, through a chokehold, “I can’t breathe” eleven times—Staten Island, New York—was resisting arrest, and therefore got what he deserved. I asked my friend had he considered the implications of his beliefs especially since that half of his own family is black. He snarled that it didn’t make any difference. And there I left the conversation, because even though I’ve known him my whole life, I couldn’t think of anything else to say. I told this story to my movie date when we saw “Selma” together. “He’s a bootlicker,” she concluded. And I did not want to think of my friend that way, but I confess I’d thought the same. “When his kids are older, he’ll understand,” she said. And I hope she’s right. His children will grow up black in a country where things like this happen. And I cannot understand why this makes no difference. To him. I wish him and his family only the best. I love him. I cannot understand him. So it was with this personal, small-scale schism on my mind that I watched Ava DuVernay’s “Selma,” a slightly fictionalized account of the voting rights marches of 1965 in the American Deep South. I couldn’t conclude whether the picture is more inspiring or wearying. Wearying, for all the struggle and bloodshed and loss of life for the rights, and the dignity, of black people in America—rights and dignity which seem almost equally tenuous, and threatened, fifty years on. Inspiring, because resistance, and the inspiration behind that resistance, continue. DuVernay ironically casts two men from the UK for her leads—David Oyelowo as King; Tom Wilkinson as President Lyndon Johnson. Both mastered Southern speech. The handsome Oyelowo retains the winning mannerisms he showed in the BBC “MI-5”—his luminous eyes shift downward when he must deliver tough news; they widen when he’s surprised that someone agrees with him. Wilkinson’s Johnson frequently disagrees with King. According to Wikipedia, experts on Johnson, including the President’s former assistant Joseph A. Califano, Jr., LBJ wasn’t as obstructionist as the film, written by Paul Webb, shows. I’m not sure who is right; I’m sorry such difficulties enter into the film, which the filmmakers admit is lightly fictionalized. With so much money, star power, period design, and modern-day relevance in the film, what a shame its makers couldn’t have come clearer on fact. 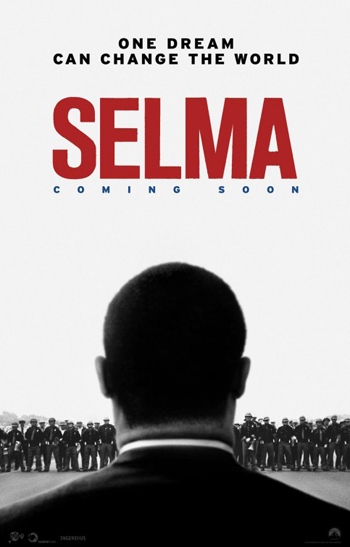 The film’s virtues include its portrait of the protest marches as a group effort, with Dr. King one leader among many; the realistic feel of the backroom debates on strategy and underlying philosophy; the mixed reactions of whites to the movement, with the suggestion that it split some white families (and even some black families); and a harrowing scene where King has to confront the fallout of his own womanizing, with his wife Coretta Scott King (Carmen Ejogo). Oppression, hate. Dignity, bearing up, wearing away the stone of hate through the streams of patience and nonviolence. This movie should start people talking, keep people talking–it might drive people apart, but it illuminates how much and how little we’ve changed, what we’ve lost, what we’ve one, and what’s at the stake, right this minute. I’m just sorry we have to have discussions about what really happened. 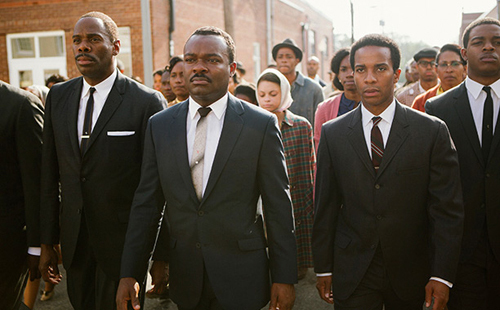 “Selma” is currently playing at several local theatres. Check local listings for prices, show times, and addresses.